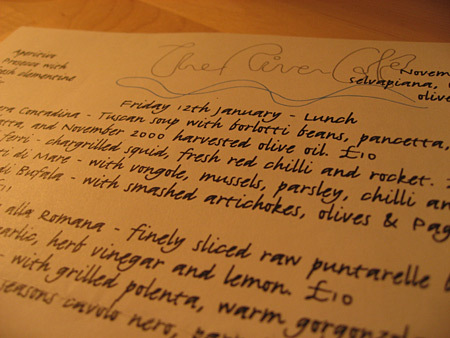 It's telling that I don't remember what I ordered at The River Cafe in London. I only remember what my husband ordered. Monkfish and ribollita. Two things I, as a recovering picky eater, never would have ordered. We were on our delayed honeymoon -- married in October and vacationing in January -- and before heading up to the wild and windswept Scottish Highlands, we were making a few pit stops. We stayed in Cambridge where we met and were lucky enough to stay "in college." Dr. Mathra's friend was a fellow at Trinity College, and he managed to get us some wonderful fellows' guest rooms. The rooms were not luxurious by any means but they were wonderfully historic -- the windows still sported indoor blackout shutters and curtains that reached from floor to ceiling -- and just so very academic. Our rooms looked out on the famous fountain and the unwalkable green lawns and grey stone paths of Great Court. We had a bedder come and "do for" our room and see to our tea needs. Before taking the train to Edinburgh, we planned to spend few days in Cambridge, visiting old haunts and old friends, and also take a side trip to London where we'd eat at The River Cafe. Everything I knew about The River Cafe came from my mother- and father-in-law. They had eaten there, loved it, and owned at least one of the cookbooks. So, we were going. We even had a copy of the menu my in-laws had saved from their visit to help us anticipate our rustic Italian meal by the Thames. Although I had definitely made great strides in trying new foods, I still wasn't wild about unknown fish, and I certainly was going to snub any dish that had unavoidable vegetables in every bite. (If vegetables are served on the side, you can pick and choose how much you want to eat, but in ribollita, you are committing to full-on vegetables in every mouthful. Unavoidable.) Dr. Mathra's ribollita was served with a hearty slick of peppery Tuscan olive oil slapped across the top. The borlotti beans were pink and plump. The broth was clear and golden. He held his spoon out for me to try. Dr. Mathra has always been generous with his food. To this day, we are so concerned about making sure the other person gets enough of some favorite food -- the bigger croissant, the last of the farro salad -- that we've had the most ridiculous back-and-forths: "You should have it." "No, YOU should have it." "Seriously, I'm fine. You didn't have a big enough serving last night." "But I was okay with that. I wasn't that hungry." "Well, that means you should have it now." ". Fine." It can actually get quite heated, all this generosity. That brisk, sunny January afternoon in Hammersmith was no different. Dr. Mathra wanted to make sure I tried his ribollita, and when I showed no signs of gagging or making faces, he encouraged me to have as much as I wanted. I had as much as my conscience would let me. It was too good. I wanted all of it! The vegetables weren't bland! The beans weren't flavorless! The broth was so savory, you could have strained everything out -- even the thick, chewy strips of pancetta and chunks of soaked bread -- and served it just like that. Naked and pure, it would have stood on its own. But lucky for me and for my future love affair with vegetables, it wasn't served on its own. It was fully stocked with carrots, onions, tomatoes, and tears of chard. I loved every bit of it. Dr. Mathra's grilled monkfish with salsa verde was no less of a revelation than the ribollita. That monkfish was my sole meunière. I was so obviously taken with the firm, delicately-flavored white fish that Dr. Mathra suggested we go halfsies on our mains. I didn't argue. As we switched plates -- something we would do for many meals to come -- I knew I had stumbled upon another reason to be grateful I had married him. I've been incredibly fortunate to eat at many fine -- even Michelin-starred -- restaurants since The River Cafe. I've sampled Ubuntu's cauliflower gratin, rolled ecstatically around in Manresa's "dirt," and had a black truffle dinner at Chez Panisse, but none of them will ever measure up to that honeymoon lunch at The River Cafe. That lunch caught me at a time when I was just waking up to how good food could be. It will always headline my "Best Meals of My Life" list. For me, it wasn't just a meal, it was an event. And it wasn't just amazing food, it was amazing food I never liked before. That's what will mean more to me than all the foams, gelees, and gilded chocolate desserts in the world. Thank you, Rose Gray. You gave me a life-changing gift, and you will be missed.